They're a diverse group of presidential candidates, and they're using diverse tactics to kick off their campaigns. 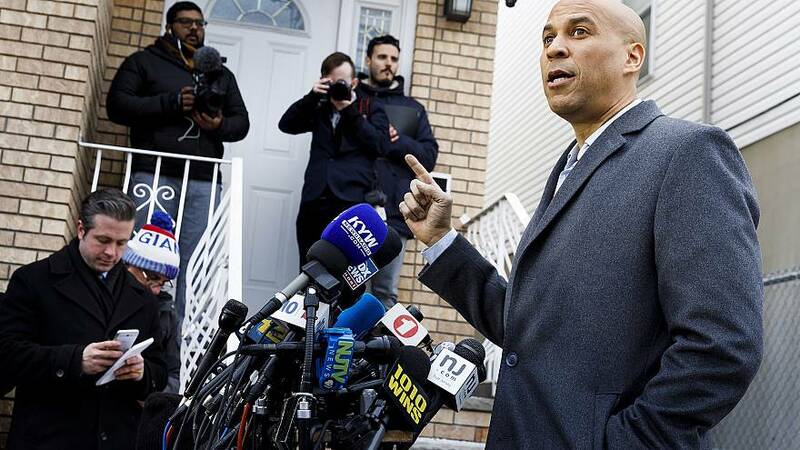 On the first day of Black History Month, Sen. Cory Booker, D-N.J., released a slickly-produced biographical video on social media before calling in to two radio shows that have a largely African-American audience and doing an interview in Spanish on Univision — all the while interacting with supporters,detractorsand the Hot Pockets brand on Twitter. Sen. Kamala Harris, D-Calif., announced she was running on Martin Luther King Jr. Day, and capped off her first week on the trail with a rally in her hometown of Oakland that drew an estimated 20,000 people — and impressed President Donald Trump. And former Starbucks CEO Howard Schultz announced he was mulling an independent bid for president in an interview with "60 Minutes," and wound up getting heckled by a protester at a book tour event. "There's no right or wrong way to roll out a presidential campaign, but there are candidates who did a better job than others," said Democratic political strategist Adrienne Elrod. "Kamala Harris had the best announcement week, hands down. She got the best bang out of her week." Trump agreed, telling The New York Times on Thursday, "I would say, the best opening so far would be Kamala Harris. I would say in terms of the opening act, I would say would be her." Hank Sheinkopf, a veteran of New York politics, said the crowd Harris drew in Oakland shouldn't be underestimated. "Among the most important things we learned in 2016 is crowds matter. We should all be paying attention to these crowds," he said. Sen. Elizabeth Warren, D-Mass., was the first big name out of the 2020 gate, announcing her presidential exploratory committee on New Year's Eve. The timing raised eyebrows, but Elrod said "it was smart." "It's a time a lot of people are watching television," she noted. The campaign video announcement for Warren, a longtime force on social media, racked up 932,579 views. She then got to show off the skills she sharpened in dozens of town halls she held during her re-election campaign when she hit the presidential trail in Iowa. At the end of her events, which drew enthusiastic crowds, she offered to pose for pictures with every attendee, and her staffers had a system worked out to make sure the process went quickly and smoothly. "Warren had a strong rollout," said Sam Roecker, a Democratic consultant in Iowa. "She focused more on the larger campaign events, where you get a couple hundred people in a room." Some of the candidates are using their rollouts to target certain demographics while playing to their strengths. Sen. Kirsten Gillibrand, D-N.Y., announced her presidential bid on "The Late Show with Stephen Colbert," and followed that up with an appearance on MSNBC's "The Rachel Maddow Show" the next day before heading out to Iowa. Roecker said her approach in the state was different than Warren's. "Gillibrand did a good job of getting out to different places and meeting people. They were more intimate" events, and in more locations, he said. In her remarks, she emphasized her "strong record of fighting for women" and "her background as mother," Roecker noted. Bill Carrick, a longtime political strategist in California, said "everybody's been a little different," but they're all trying to stake a claim to their base. One of Harris's first stops was to address 3,000 members of her sorority, Alpha Kappa Alpha, at a gala in South Carolina. It's the country's oldest black sorority. "She's emphasizing the importance of the African-American vote and that she's going to make a play in South Carolina," Elrod said. Julián Castro, former mayor of San Antonio and former housing secretary, announced his candidacy in Texas in English and Spanish, and then headed to Puerto Rico, where he reviewed hurricane recovery efforts and blasted the president's call for a wall along the southern border. The rollout was "a little more traditional for Castro" than some of the other candidates, Carrick said, adding that "it's obvious that everyone is thinking through what kind of coalition they're going to put together. You campaign with your base, where you're starting from, and then look at how you expand it." Pete Buttigieg, mayor of South Bend, Indiana, became the first openly gay candidate in the race in late January, and at age 37, he's trying to appeal to millennials with a message of "intergenerational justice." Carrick said Buttigieg has been "pretty good" in his TV appearances, but asked, "can he be a real candidate? I don't know." The strategists were unimpressed with billionaire Schultz and Hawaii Democratic Rep. Tulsi Gabbard. Schultz, who's mulling a run as an independent, was mocked for saying "I don't want to talk in the hypothetical about what I would do if I was president," and his attempts to engage with the public on Twitter have backfired. Gabbard, meanwhile, is parting ways with the manager for her campaign, which officially launched Saturday. She's also had to issue a video apology for her past comments about LGBTQ rights, which resurfaced after she said she planned to run for her party's nomination last month. "That's not the way you want to get started," Carrick said.